You are here: Home > T-Mobile G-Slate Android 3.1 Honeycomb Update Rolling Out Now! 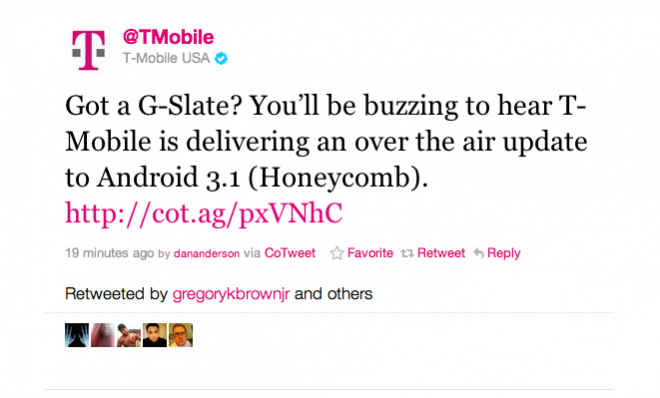 T-Mobile G-Slate Android 3.1 Honeycomb Update Rolling Out Now! So what kind of new goodies will you find with this update? Although my ASUS Transformer has 3.2, I had 3.1 for about a week on it. 3.1 is a great update and all you Slate owners will appreciate it. A bit of news for you all. Google is being very aggressive about updating ALL Honeycomb tablets because of the competitive environment due to the iPad. So if LG stays on top of this (as ASUS is doing with my tablet), look forward to 3.2 quite soon. I wouldn’t count on it. 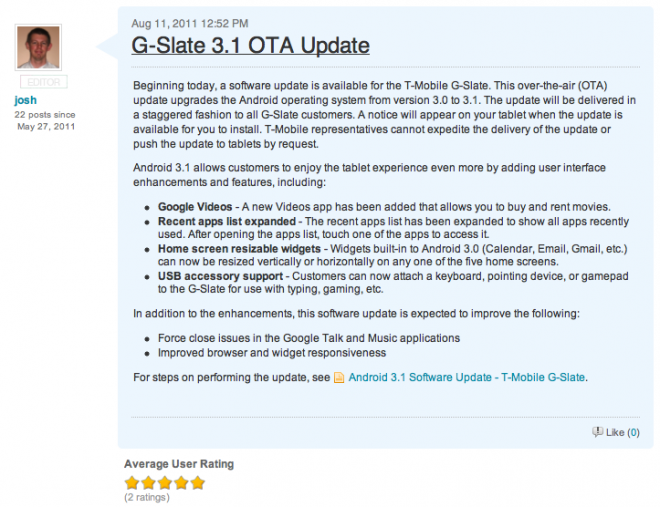 It took LG 3 months to put 3.1 on the G-Slate. I’m also a happy owner of an Asus Transformer (with docking station) and have been quite pleased so far with my purchase. It doesn’t hurt that Asus is prompt on the updates. Yeah, I have the dock too. But since this article was about the Slate, I did not want to talk about my Transformer. The ASUS Transformer is the best tablet on the market, IMO. Cost us plenty though. I paid $700 for the tablet, dock, and including sales tax. Way too much, but I am quite pleased also. Its LG with a tmob skin, don’t tease them Mike. Nothing yet on mine but I am certainly looking for it. The G-Slate is majorly under-rated and I am glad to see it getting more attention…even if just for a simple update. It’s maddening waiting for an OTA Update notice. Thought you left micheal not Mike still have some lingering hardware do ya? My disabled sister was with T-Mobile. Her contract expired and it’s a hassle for her to learn anything new or deal with switching carriers. So I recommended she sign a new two year deal with T-Mobile. She asked if I would watch over her when dealing with the account and I said yes. So I’m still indirectly with T-Mobile. I use mine on wifi only, and will I still get it? My ASUS Transformer tablet is a WiFi only machine. All that means is that I “borrow” a home, office or “Starbucks” Net connection for the tablet to connect to the Net. So when you are using WiFi on your Slate, you are nevertheless connected to the Net and should get the OTA update notice. (Providing you are in fact connected via WiFi. If it’s turned off then obviously you are not getting a connection.) I would leave it connected full time so you get the OTA notice when it is sent to you. Also, don’t forget to connect to settings and manually check if there is a “system update.” That sometimes works. I have a g slate that I use over wifi only and I received the 3.1 update yesterday. So it doesn’t matter that it is only used over wifi. Lucky that, now that you can use a pouting device there will be difficulty complaining about the upgrade. Has anyone else not recieved this yet? I’m still waiting in San Diego, CA. Tick tock, tick tock. LG WTF!!! Has anyone at all received this flipping update yet?????? I haven’t gotten any update on my G-Slate. Maybe this will be like the G2X update that no one I personally know has received on theirs. Just got my 3.1 !!! !